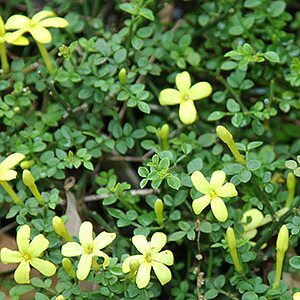 The low growing Jasminum parkeri is a dwarf variety that can be used as a ground cover plant. Attractive yellow trumpet shaped flowers and deep green foliage. This is a bushy slow growing plant make it useful in a range of landscaping situations. Rarely reaching over 25 cm in height however spreading to around 50 cm, over time it forms a small rounded mound. Also know as the ‘Rock Jasmine’. Jasminum parkeri grows well in full sun and makes an excellent addition to the rock garden. Also useful in the general garden border or it can be used as an interesting container plant. Use it as a small shrub in a corner near a pathway. A well drained humus rich soil is essential, moisture over spring and summer will improve what is a slow growth rate. Mulching around the plant will help retain moisture and a regular top dressing with some cow manure and compost will help keep the plant looking good. Jasminum parkeri will send down roots from where stems touch the ground, however it is best to peg down these stems to improve the probability of this method of propagation being successful. Rarely available for sale as it very slow growing and does not seem to be regarded as commercially viable. Watch for it at collectors plant fairs.